Laying Low the Shibboleth of a Free Press: Regulatory Threats against the American Newspaper Industry, 1938-1947. Journalism Studies. As American newspapers came under various forms of financial strain in the 1940s, arguably the most significant threat facing the industry during this period was an onslaught of media criticism in conjunction with a series of attempted state interventions. This paper fleshes out recurring themes of 1940s media criticism and shows how they coincided with moves toward regulating the press, which had begun in the late 1930s. Using historical methods, including close readings of newspaper, trade press, and activist literature and other materials that shed light on debates around press reform, this critical revisionist history brings into focus a formative period in the American press system’s development. The history that emerges from this archival evidence does not simply bring previously under-researched areas into focus; it also questions the presumed natural laissez-faire arrangement between the American government and the press*an assumption that largely remains intact to this day. Social Democracy or Corporate Libertarianism? Conflicting Media Policy Narratives in the Wake of Market Failure. Communication Theory. “The Air Belongs to the People”: The Rise and Fall of a Postwar Radio Reform Movement. Critical Studies in Media Communication. The postwar 1940s witnessed the beginnings of a full-fledged broadcast reform movement composed of labor activists, African Americans, disaffected intellectuals, Progressives, educators, and religious organizations. Although this reform movement would never realize the full sum of its parts before it was quelled by reactionary forces, it would succeed in registering significant victories as well as laying the necessary groundwork for future reform. The following analysis draws from archival materials and interviews to recover a largely forgotten moment in broadcast history, one that holds much contemporary relevance for current media reform efforts and media policy issues. The Battle over the FCC Blue Book: Determining the Role of Broadcast Media in a Democratic Society, 1945- 1948. Media, Culture & Society 33(2)171-191. During the 1940s a media reform movement of grassroots activists and a progressive Federal Communication Commission (FCC) emerged to challenge the commercial interests consolidating control of US media. A key initiative born out of this movement was the so-called Blue Book, a high-water mark for FCC progressive activism that mandated social responsibility obligations for broadcasters in return for their use of the public airwaves. Ultimately, red-baiting tactics defeated the policy initiatives outlined in the Blue Book and the media reform movement was largely contained. The following analysis draws from archival materials to illuminate the resulting arrangement for US broadcasters. Can Government Support the Press? Historicizing and Internationalizing a Policy Approach to the Journalism Crisis.The Communication Review 14 (2)73 – 95. Although consensus has been reached that journalism is in crisis, few agree on the nature of its decline or the means of resolving it. 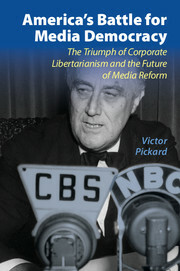 After providing an overview of this ongoing debate, the author contextualizes the journalism crisis within several historical, political, intellectual, and structural processes that help highlight what is at stake and what can be done to support the journalism required for a democratic society in the United States. He concludes with an emphasis on normative considerations regarding the future of journalism and provides several policy proposals that aim to provide the resources necessary for a robust and independent press. These policies, he suggests, will help facilitate the transition from a failing commercial media system to a public-service model of the press. Sascha Meinrath, James Losey & Victor Pickard (2011). Digital Feudalism: Enclosures and Erasures from Digital Rights Management to the Digital Divide. CommLaw Conspectus: Journal of Communications Law and Policy, 423-479. As we enter the second decade of the 21st Century, we find ourselves at a rare historical moment—a time of great opportunity fraught with substantial pitfalls. Numerous potential trajectories of the Internet may unfold before us. While decentralized and participatory platforms have birthed a revived move- ment for democratized media production, these phenomena depend on the common resource of the Internet; common not in ownership of the integrated networks, but in non-discriminatory access and use of the network. However, as markets evolve, there is a growing uncertainty that policy decisions sur- rounding the Internet will benefit the general public. Even as social networking and media production have empowered users, less visible structural changes threaten to foreclose many of the Internet’s democratic possibilities. Despite the popularity and political power of innovative services like YouTube, Face- book, and Twitter, structural changes threaten to foreclose many of the Inter- net’s democratic possibilities. Furthermore, recent developments in digital rights management (“DRM”), net neutrality, and user privacy reveal unprece- dented attacks on basic Internet freedoms. ‘Whether the Giants Should Be Slain or Persuaded to Be Good’: Revisiting the Hutchins Commission and the Role of Media in a Democratic Society. Critical Studies in Media Communication, 27, 4, 391-411. This paper examines the landmark Hutchins Commission’s unpublished minutes and correspondence to uncover a potential radicalism that advocated for and then shied away from significant structural reform of the US media system. With an eye towards contemporary media problems, this project aims to recuperate lost alternatives and yield fresh insights regarding the institutional role of the press in a modern democratic society. By situating the Hutchins Commission in a historical trajectory of media criticism and media reform movements, this paper illuminates perennial tensions and confrontations between the liberal ideals and commercial imperatives driving the US press system. Drawing from Gramscian theory to contextualize the US media system’s current crisis, the paper concludes by outlining an emergent consensus that calls for structural reform and for re-evaluating core normative democratic principles underpinning the social contract between US media institutions and the public. Reopening the Postwar Settlement for U.S. Media: The Origins and Implications of the Social Contract between Media, the State, and the Polity. Communication, Culture & Critique 3, 2, 170-189. Drawing from archival research, I historicize current media policies and reform efforts by analyzing the 1940s critical juncture when policymakers, social movements, and communication industries grappled over commercial media’s role in a democratic society. By focusing on policy formations around the Hutchins Commission and the FCC’s ‘‘Blue Book,’’ I propose that a suppressed media reform movement resulted in a ‘‘postwar settlement’’ marked by three assumptions: media should remain self-regulated, practice social responsibility, and be protected by a negative freedom of the press. This social contract consolidated an industry-friendly arrangement that contained reform movements, foreclosed on alternative models, discouraged structural critiques of the U.S. media system, and privileged media owners’ rights over those of the public’s — a relationship that continues today. Victor Pickard & Sascha Meinrath (2009). Revitalizing the Public Airwaves: Opportunistic Unlicensed Reuse of Government Spectrum. International Journal of Communication, 3, 1052- 1084. While many policy analysts have focused on the fate of the 700 MHz auctions, the digital TV transition, and the promise of white space devices, a more vast and underutilized resource has gone largely unnoticed: government spectrum. The best available data suggests that the majority of federal spectrum capacity is left unused. Strategic reuse of this spectrum could help obviate the need for significant additional reallocation while enabling a wide range of creative new uses and social benefits. Based on what little information is publicly available, it is reasonable to assume that the repurposing of government spectrum would go far in addressing a number of access-related communication problems. Repurposing currently unused U.S. government-controlled spectrum for opportunistic unlicensed use would benefit society by dramatically expanding access to high-speed broadband and increasing the pace of wireless technology innovation. This approach to spectrum policy presents a “third option” for reform, drawing from both the commons and property rights models of spectrum management. Sascha Meinrath and Victor Pickard (2008). Transcending Net Neutrality: Ten Steps Toward an Open Internet. Journal of Internet Law, 12 (6), 1, 12-21. The past few years have witnessed a once-obscure issue known as “net neutrality” blow up into arguably the most publicized policy debate in US telecom- munications history. An untold story is how this relatively technical debate spilled outside the rarefied airs of Congressional Committees and the Federal Communications Commission’s (FCC’s) eighth floor to rage across the blogosphere, major newspapers, YouTube clips, and episodes of The Daily Show to become, if not a household phrase, a topic of popular debate involving millions of Americans. One explanation is that, at its root, the net neutrality debate is far more significant than a squabble among technocrats. Rather, it is first and foremost a normative debate, one that will deter- mine the role of the Internet in a democratic society, with profound implications for the daily welfare of mil- lions of citizens who rely on the Internet as a critical resource. Unfortunately, it is such normative concerns, along with related political and historical contexts, that have been least explored in much of the net neutrality scholarship to date. This article aims to address these gaps while expanding the parameters of the existing debate. Cooptation and Cooperation: Institutional Exemplars of Democratic Internet Technology. New Media and Society 10 (4), 625-645. This article examines how online political groups are co-opting internet technology from commercial interests to amplify various cooperative processes.After formulating a framework for praxis-based democratic theories of technology, I select four internet-based groups as institutional exemplars for analysis: Democratic Underground, Free Republic, Indymedia, and Move On.These groups implement distinct types of democratic applications of internet technology and embody specific strands of democratic theory. I conclude by commenting on the direction of internet-based democratic practices, their political efficacy in terms of strategy and tactics, and how they figure within US political culture. The New Network Neutrality: Criteria for Internet Freedom. International Journal of Communication Law and Policy, 12, 225-243. The meteoric rise of network neutrality’s prominence as a crucial Internet policy debate has led to current events far outpacing theoretical and historical analyses. This paper addresses this lag in scholarship by contextualizing recent events in relation to historical telecommunications antecedents. In doing so, we critically evaluate the current network neutrality debate and offer a set of technical and policy guidelines for a new, more broadly defined network neutrality. Specifically, we submit that beyond redefining network neutrality, we must connect issues usually dealt with separately – issues that are actually a subset of one overarching concern: Internet freedom. We conclude with an exploration of the social and political impacts of this broader conception of network neutrality and suggest that this “new network neutrality” provides a proactive foundation for supporting the goal of creating a more open and participatory Internet. Neoliberal Visions and Revisions in Global Communications Policy from NWICO to WSIS. Journal of Communication Inquiry, 31 (2), 118-139. The author proposes that any account seeking to contextualize crucial policy debates con- nected to the World Summit on the Information Society (WSIS) must engage with two necessary projects. First, it must historicize WSIS in relation to an earlier international forum similarly focused on global communications policy, the New World Information and Communication Order (NWICO). Second, it must theorize WSIS in terms related to neoliberalism, the dominant political economic system defining global relations today. This analysis brings into focus both continuities and changes in global communications policy during the formative period of the past three decades. Assessing the Radical Democracy of Indymedia: Discursive, Technical and Institutional Constructions. Critical Studies in Media Communication, 23 (1), 19-38. United yet Autonomous: Indymedia and the Struggle to Sustain a Radical Democratic Network. Media Culture & Society, 28 (3), 315-336. In the fall of 2002, the Indymedia global network was in crisis. A $50,000 Ford Foundation Grant solicited for an international network-wide IMC (Independent Media Center, i.e. Indymedia) conference had seemed im- minent, but months of preparation came to naught when one member organization, the IMC in Argentina, exercised what amounted to a ‘block’ in the consensus process, thus bringing the money and the conference to a halt. Argentina IMC members considered Ford Foundation money tainted by historical ties. To accept the money, in their opinion, would irreparably compromise IMC principles. Lisa McLaughlin and Victor Pickard (2005). What is Bottom Up About Global Internet Governance? Global Media and Communication, 1 (3), 359-375. This article maintains that the price for inclusion in the World Summit on the Information Society – which finally has been achieved through the Working Group on Internet Governance (WGIG) – has been the erosion of an oppositional civil society within the summit itself. Specifically, it evaluates the development of the WGIG as a manifestation of global neo-corporatism. In doing so, the article addresses recurrent patterns within neo-corporatist policy concertation that is oriented toward satisfying neoliberal economic imperatives. The objective of this article is to provide an analysis of processes by which the diversity of interest representation that was characteristic of the first phase of the WSIS has become condensed into one agenda item focused on internet governance. W. Lance Bennett, Victor Pickard, David P. Iozzi, Carl L. Schroeder, Taso Lagos, and Courtney Evans-Caswell (2004). Managing the Public Sphere: Journalistic Construction of the Great Globalization Debate. Journal of Communication, 54, 437-455. There is little consensus on what constitutes open, deliberative media discourse. We offer a simple, measurable, and comparative model based on 3 aspects of source and issue construction in news accounts: access, recognition, and responsiveness. The model is applied to coverage of 2001–2003 World Economic Forum (WEF) meetings and protests against the organization’s role in global economic policies. Both demonstrators and WEF participants were granted news access, but WEF actors were recognized more formally and given greater input in news content, including ownership claims to many activist issue positions. Journalistic deference to the WEF communication agenda limited mutual responsiveness. The journalistic process systematically managed the debate about globalization on terms that favored elites over citizen-activists. Kevin Coe, David Domke, Erica Graham, Sue John and Victor Pickard (2004). No Shades of Gray: The Binary Discourse of George W. Bush and an Echoing Press. Journal of Communication, 54, 234-252. Binary communications represent the world as a place of polar opposites. Such conceptions of reality, although not uncommon in Western thought, take on a heightened importance when political leaders employ them in a concerted, strate- gic discourse in a mass media environment. With this in mind, this research offers a conception of binary discourse and uses this as a foundation to examine (a) the use of binaries by U.S. President George W. Bush in 15 national addresses, from his inauguration in January 2001 to commencement of the Iraq War in March 2003, and (b) the responses of editorials in 20 leading U.S. newspapers to the president’s communications. Sascha Meinrath & Victor Pickard (2009). Communication Rights in a Global Context. In Robin Anderson and Jonathan Gray (Eds. ), Battleground: The Media, Vol. 1. Westport, CT: Greenwood Press, pp. 91-97. The Indymedia Model: Strengths and Weaknesses of a Radical Democratic Experiment. Global Civil Society Yearbook 2007/8: Communicative Power and Democracy. London: Sage Publications, pp. 207, 210-212. Alternative Media. In Todd M. Schaefer and Thomas A. Birkland (Eds. ), The Encyclopedia of Media and Politics. Washington, DC: CQ Press, pp.12-13. Telecommunications Act of 1996. In Todd M. Schaefer and Thomas A. Birkland (Eds. ), The Encyclopedia of Media and Politics. Washington, DC: CQ Press, p.280. Understanding Communication Power. Invited review of Manuel Castells’s Communication Power, for Global Media and Communication 7 (1), 54-56. Future Active and the Future of the Internet. Review of Graham Meikle’s Future Active: Media Activism and the Internet. Resource Center for Cyberculture Studies. November 2005. Victor Pickard, Josh Stearns & Craig Aaron (2009). Saving the News: Toward a National Journalism Strategy. Free Press. Revitalizing the Public Airwaves: Opportunistic Unlicensed Reuse of Government Spectrum. New America Foundation.